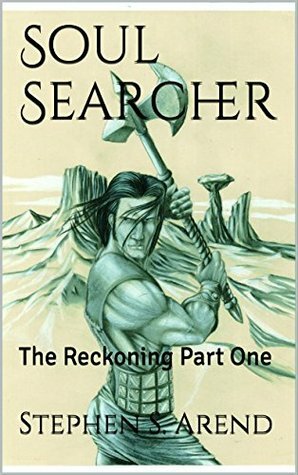 In Stephen S. Arend’s Soul Searcher The Reckoning Part One the reader will find themselves on an incredible journey that will not only take them to the heart of battle but to the depths of the human soul. In a world where magic is as common as breathing, a soul transfer goes terribly wrong. The Mage-Lord Mordeth is attempting to complete a magic ritual where he can obtain a sliver of immortality. Thwarted and split in two the reader will meet the protagonist of Arend’s tale: Rork. A crafted man with half a soul and even less emotion, Rork prowls the world trying to deny the dreams he has which give small betrayals of his involvement with Mordeth. A large man who has been alive for only ten years Rork finds that he is missing much and is less than reluctant to find out where exactly he came from and how. Arend does a wonderful job when it comes to emotion in his tale. Rork is full of rage and anger for a variety of reasons. He has been alive for a snippet of time. All he knows is battle and the haunting dreams that plague his sleep. Due to his firecracker temper which is liable to go off at the drop of a pin Rork finds himself saddled with an unexpected package: the scout Bregan. It seems like oil and water have met and are now expected to become friends. Rork immediately voices his disapproval over traveling with the young whip but what he will ultimately learn from his adventures with the scout. Both are more like boys in the beginning and Arend captures the metamorphosis into men quite well. In a fantastically described world where magic is woven with intricacies even the smallest detail is given quite beautiful description. It is quite easy for the reader to picture the story in their minds as they read. You won’t be left guessing what expression the characters were wearing or what color the trees are when you read Soul Searcher. For a first part Arend does masterfully in capturing the readers’ attention and lays out the ground work for subsequent tales. Information is freely given yet there is still more to be learned. These are key elements in any piece of work that is meant to go longer than the tome at hand. Soul Searcher is a fantastical novel that is sure to delight those who read it. It’s not a fluffy piece where magic is used to make tarts and cakes. This is an involved and epic tale that is sure to keep your eyes glued to the words until the very end.